A neighbor saw a bundle of wool in a field, on the ground. He discovered that the wool was a live sheep, frozen to the ground. 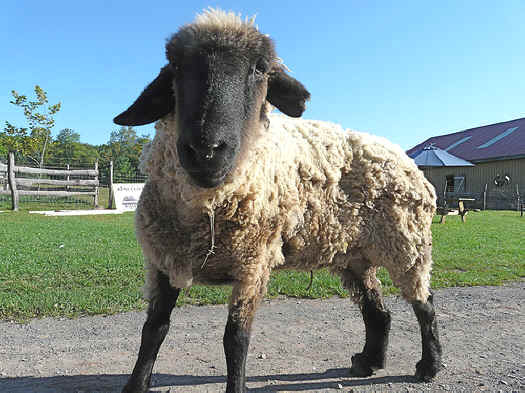 Louise was rescued in a neglect case, from a farmer who raises lambs for meat. A neighbor saw a bundle of wool in a field, on the ground. He discovered that the wool was a live sheep, frozen to the ground. He talked to the farmer who knew she was there, but was going to let her die. The neighbor took the sheep off the farmer’s hands and cared for her until he moved. Louise lost part of her left ear to frostbite and, while the neighbor was well-meaning, he didn’t realize that she had a severely overgrown back hoof which was twisting the ankle on that leg. When the neighbor brought Louise to WFAS, we trimmed her hoof and had vets look at the problem. She was fitted with shoes to help adjust her ankle over the next few months. Nothing seemed to help a lot, so Louise has a slight limp. But she gets around really well and is always calling for attention. She likes to be with the flock sometimes, but other times, she meanders off on her own to graze in the field, or to stand by the fence and demand attention from the humans. We often let her out to free-range around the farm. We close the gates so she doesn’t graze on the new trees on the lawn. But she’s learned that she can take the long way around, past the duck pond and the roosters. You can watch her trotting along the far side of the pig pasture, on a mission to the trees. A bigger priority than the trees, though, is following anyone doing chores that might involve treats. Or pets. Despite everything, she really loves people. She will put her face right next to yours as you pet her head and the one perfect ear – and the other ear, just as perfect in a different way, that reminds us of where she came from.